When we were looking at houses seven years ago I had a list of things I wanted: an older home with a front porch and a fireplace, and tons of vintage charm. A bungalow would have been perfect. We bought a 1960 split level with a bad septic system and a tainted well. But at least we got it for a good price! ;) This was at the height of the real estate boom, and we considered ourselves lucky to even find a house after selling our townhouse in 4 days. So it wasn't my dream home, but over the years I think we've made it our own. We love the area and the countryside is open all around us. The house was being sold by the estate of the original owner, so all the "period" 1960 details were mostly intact. There were two things that closed the deal for us: a knotty pine-paneled family room and an original pink bathroom. 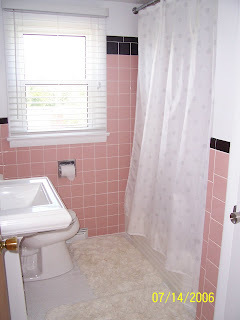 I wanted the pink bathroom because my grandmother had one, and I inherited all her vintage pink towels. Nothing like matching your bathroom to your towels! 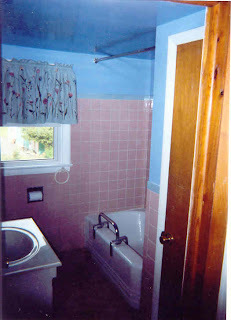 Besides, the pink bathroom is an icon of mid-Century America and so many have been ripped out in favor of the trendy "spa-like" look that I thought it was time someone made a stand. So we embraced our pink bathroom, even retro-vating it a little by installing a white hex tile floor in place of the previous carpet. (Which was pink shag, although until we took out the vanity that sat on top of it, I thought it was brown! Blech!) We installed a pedestal sink, new light and painted the walls white. We also replaced the baby-blue tile border with black, which I think makes it a little more sophisticated. First here's the "before" picture- the walls and ceiling were freshly painted like the inside of a swimming pool, presumably to match the blue tile, although it glowed like neon! I think it came out quite well, don't you? Lovely job on your renovation! Thanks. You know, before we moved into this house (you remember our stenciled townhouse, LOL) I had seen that light and thought it was really cool, but couldn't make it work there. Then when we moved here, I knew it would be perfect. And as luck would have it it was on clearance for less than half of what I had seen earlier! 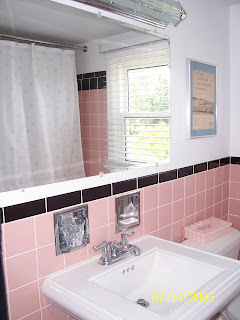 I've always loved vintage tiled bathrooms and aren't you the lucky girl to have a pink one! Amazing!! I always love a pink bathroom. Don't know how I missed this post. I love what you did to the bathroom. LOL! I just cleaned that bathroom and came down and moderated your comment...:) Still looks good, although with the kids it gets dirty very quickly these days!